If you have a child in your life, no doubt you are familiar with Thomas the Tank Engine. Ranking up at the top of the favorites list for young children, Thomas and all things dinosaur never fail to put a smile on a child's face. What could be more fun than treating a child to a Day Out With Thomas? All aboard! 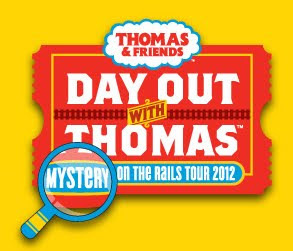 Thomas the Tank Engine™ is chugging into a station near you for Day Out With Thomas™: Mystery On The Rails Tour 2012. Thomas fans are invited to come spend the day with their favorite No. 1 engine. For over 65 years, children have been captivated by the courageous adventures of Thomas and his engine friends. During its 17th consecutive year, Day Out With Thomas will make stops in more than 45 cities in the United States and Canada and is expected to welcome more than one million passengers. My own children and my nephews have enjoyed several years of the annual Day Out With Thomas event and I can attest to the fact that this is a fun kid adventure not to be missed! Tour dates for 2012 are available at select locations across the country from July to November. Courtesy of Closer To Lucy, That's What She Said readers are invited to enter the giveaway below for four Day Out With Thomas tickets. Please note: These tickets are for a Day Out With Thomas train ride on September 1, 2012 at 12:00noon in the Nashville, Tennesee area. Images and information sourced from Day Out With Thomas website. I have received no compensation in exchange for this post. The opinions above are both honest and of my own experiences. Giveaway is managed by Closertolucy.com. Thomas seems to be a fun theme for most young children. My kids loved him and his friends, and my grandchildren do as well.